UK, 2016, 91 minutes, Colour. Jennifer Saunders, Joanna Lumley, Julia Sawahla, Jane Horrocks, June Whitfield, Mark Gattis, Graham Norton, Kathy Burke, Celia imrie , Robert Webb, Stella McCartney?, Kate Moss, Emma Bunton, John Hamm, Jeremy Paxman, Rebel Wilson, Jean- Paul Gaultier. Comedy is always a matter of taste as well as of a sense of humour and particular sensibilities. In the 1990s, there was great enthusiasm for the British television series, Absolutely Fabulous. It was in the satirical tradition, spoofs and send ups in an elaborately stylised way. it always depended on audience response to the comedy of Jennifer Saunders, a clever writer responsible for the series, and the over-the-top of Joanna Lumley’s screen presence and calculated exaggerations. capital is a great opportunity to poke fun at the British chattering classes and their pretensions. There was also Julia Sawahla as Jennifer Saunders’ very serious daughter, comic touches from Jane Horrocks as the assistant and some cameos from veteran actress, June Whitfield, as the mother. So, somebody decided that this particular time was right for the characters all turning up again – and all of them do, Jennifer Saunders as Edina, older and, she comments, having put on weight, Joanna Lumley as Patsy all over again, an older Julia Sahwahla, now with a young daughter, and Jane Horrocks’ Bubbles ebullient as ever. But, what are they going to do about a plot? Edina is still an agent but on the lookout for clients, Patsy is always there, drinking, smoking, irrelevant comments, but a staunch friend. The basic idea for the film is that they go to a fashion show – with a whole lot of actual celebrities all turning up for their cameo minutes, especially Lulu who gets into the plot and designers like Stella McCartney?. And very amusing episode with Mad Men’s John Hamm. The main target is Kate Moss but Edina’s rival, played by an unscrupulous Celia Imrie, is also interested in signing up the model – and in the haste Kate Moss goes over the balcony into the Thames, disappears, is presumed dead, media uproar, the besieging of the house, and Edina accused of murder. So, what else to do but to have the two women disguised and escaped to the French Riviera where they live the high life, always shrewd in extracting money and favours, especially with Patsy looking up an old flame, an old roue who made “adult” films – and, though it takes only a moment, we recognise he is being played by Barry Humphries. A few moments later with a lot of elderly people in a swimming pool, Dame Edna also pokes her head out of the water for a few unmistakable seconds! There are a whole lot of shenanigans on the Riviera, Edina taking her granddaughter as a ploy, her daughter pursuing her, the police – and again, a number of cameos of celebrities, including Jean- Paul Gaultier doing a bit of prospecting on the beach. And rebel Wilson doing a very funny turn as a flight attendant on a very cheap airways. 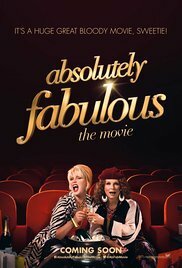 It will depend on your sense of humour, on your liking for Absolutely Fabulous, and the realisation that it is not a rip-roaring comedy but that there are a lot of amusing situations, some amusing lines, and, mostly, the opportunity to see Edina and Patsy all over again.